I have to admit I really love lasers and have always enjoyed laser tag. Ever since I played laser tag my freshman year in college, I found that this game can be really, really fun. There is something exhilarating about running around chasing each other with fake space age weapon. I still enjoy playing laser tag, but now I get to play with my kids. Laser tag can be a great active sport for kids of all ages. I am always looking for ways to get my kids outside and to be active. There are a lot of laser tag sets out there. Many of these sets look and feel similar. How do you know what set to buy for your kids? Gun or Kit. Some laser tag sets have vests, some have targets, and some have electronic spiders. Accuracy. How consistently does the laser gun shoot? Some of these guns are very consistent, while others are not as reliable. Distance. How far can the gun shoot? You want a gun that can shoot at least 20 feet indoors accurately. Game modes. Can the guns play against each other? Can you adjust the amount of lives? Does the game allow for target practice? Price. Laser tag guns can cost $10 to over $25 each. Sometimes the difference between the guns is very subtle. You want to make sure that you are getting good value for your hard earned dollars. Paring for large groups. Can the guns work together with another 2, 4, 6, 8 or more guns to make a large laser tag game? Batteries. What kind of batteries do the guns and vests use and how long do they last? 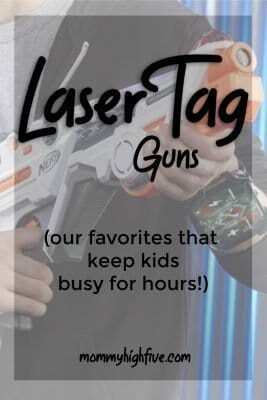 Here are our top recommended laser tag blasters for children. These blasters are reasonably priced, and all will give you and your children a good laser tag experience. NERF is known for its soft pellet guns, but they also make 3 of the top laser tag guns out there. These 3 laser blasters will let your kids run, laugh, cry, and play without having to do any clean up after. 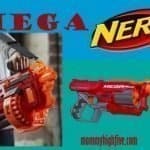 The NERF Fire Combat is a great highly technical gun. 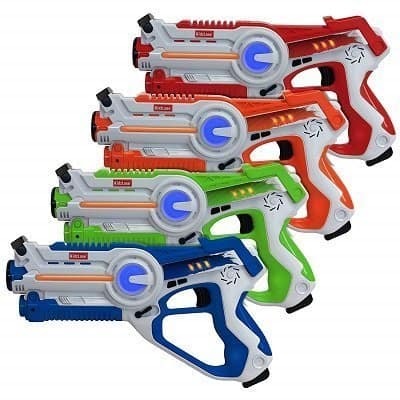 These make great guns for a laser tag event, party, or even for a store to run. This does not feel like a toy like some of the rest of these guns. This is definitely best suited for a tween or older. If you want to run a gun-only laser tag game, this is the one you want to get. 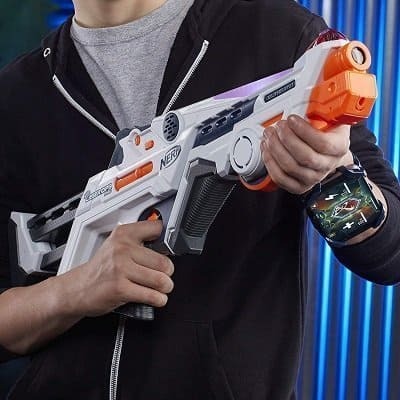 NERF also has made a great app to go with the gun, and this kit comes with a phone holder so that you can run around with the NERF gun and keep your phone app handy. The Fire Combat is really well built and has fantastic accuracy, which is really important for a competitive game. The NERF Laser Ops Pro uses a multi-shot IR shot with each trigger. The Fire Combat comes with an LCD screen to display the number of shots remaining as well as your lives. This is not the cheapest option out there with a cost of about $40 per gun, but it is a great option for older kids and adults. Its durability also makes a great choice for church groups or places that are going to play regularly. The Fire Combat can be set up to run team games or every man for himself. The app can tell you how many hits you have when you are in the middle of a NERF laser battle. The best part of the NERF app that can be used with the NERF gun is that it displays all the stats a laser tag pro can handle. Who doesn’t want to know how they are doing in a laser tag battle? The app will also let you know where opponents are so you can watch your back. 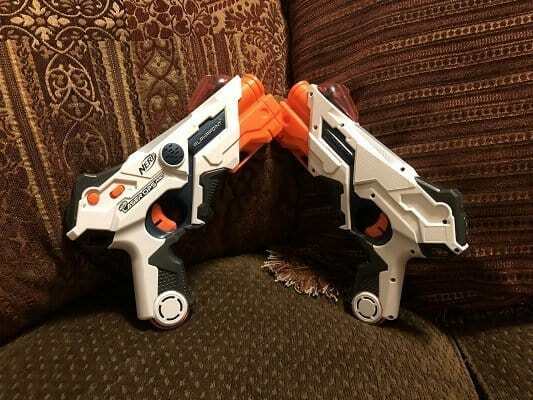 Each gun requires 6 AA batteries so I’d highly recommend getting a battery charger and rechargeable batteries if you are setting up a battle with the NERF Laser Ops Pro Burst Fire Combat. I would recommend this gun for ages 10-years-old and older. These two blasters have brought my family a ton of fun. My 8-year-old and 10-year-old love to chase each other around the house with the NERF Laser Ops Pro AlphaPoint.This set comes with 2 laser tag guns. The NERF Laser Ops Pro AlphaPoint is the little brother laser system of the bigger laser rifle Combat Blaster. 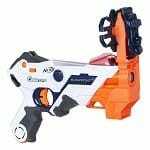 It is much smaller and more compact than its bigger brother making it more desirable for younger kids, while maintaining its good features including the NERF laser Tag App. For around $20 this gun packs a punch and is a good value especially for younger kids. Just like the Combat Blaster, the AlphaPoint is jammed pack with great features especially for the price. The NERF Laser Ops Pro uses IR lasers to fire up to 225 feet away. Like many of the other NERF laser tag guns, the Laser Ops Pro app can be used in combination with the app to allow users to keep track of your stats. This set comes with the 2 laser tag guns and 2 phone holders. Each laser tag gun requires 4 AA batteries. Like with the other laser tag guns, I’d highly recommend rechargeable lithium batteries and a battery charger. One of the best features on the gun is that you can change from indoor to outdoor game mode to adjust for the different lighting conditions. This gun is great for a one on one battle or for a NERF laser war. The NERF Laser Ops Pro would be perfect for kids ages 4-years-old and up. If you’re ready to take your NERF battle outside with your family, this is a great laser tag set to buy. While this isn’t the best gun, it is probably the best value of the NERF category. The LTX comes in a set of two guns and costs a little more than $30 per gun. These guns are pretty small and are easy for even small younger hands to use. The Phoenix LTX is capable of being pared with a huge amount of guns at once. The Phoenix allows for free-for-all and team games. Not to be limited by two teams, these guns can be set to multiple teams. One of the best features of the gun is that the number of lives can be set for as many hits as you want. This allows new laser tag players to be given a boost to make for a competitive game with players of a higher skill level. The Phoenix can be easily used indoors or outdoors. It vibrates when you get hit and is loaded with tons of fun sci-fi type sounds and noises. This set comes with two guns and no other accessories. I think the NERF Phoenix could be fun at 5-years old, but probably is best played at the recommend 8-years-old and older. NERF is definitely not the only game in town when it comes to laser tag guns and sets. 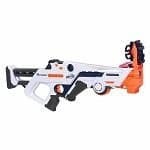 These laser tag guns have many great features that the NERF guns do not offer, including different weapon modes. These 4 options will bring any laser tag fanatic hours of fun. ArmoGear Laser Tag Blasters set may be the most complete laser set we reviewed. The ArmoGear Blasters are a laser tag party in a box. The blasters can be set up in up to four different teams. They can also be set up in 4 different weapon game modes including: pistol, shotgun, machine gun, and rocket launcher. Both girls and boys alike will like the bright colors of this set. 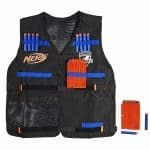 This set is an incredible value, coming with not only 4 laser tag guns, but 4 vests to go with it. If you have ever gone to play laser tag at a laser tag arena, you know that it can be easy for people to cover up their laser tag gun sensor. Without a vest laser tag play is good, but with a vest or a chest sensor it is much better. ArmoGear provides both in this value packed set. As a word of warning ,the vests that are included in this are not very big and don’t fit adults or even teens very well. That being said, adults and kids can wear them and even with the awkward look, the vests are still better than not having one in a more competitive laser battle. These guns have infrared lasers that can fire up to 150 feet. The vests and guns each require 3 AA batteries each. The only negative to these guns is indoors you don’t have to aim much in close combat. The lasers seem to bounce off walls and hit just with a close shot. I’d recommend this set for ages 4-years-old and up. My only caveat on the upper age limit is that the vests are not very comfortable once your kids get heavier than about 75 pounds. Kidzlane makes a very high quality laser tag gun. This laser blaster set comes in blue, green, red, and orange and would make an excellent birthday gift. 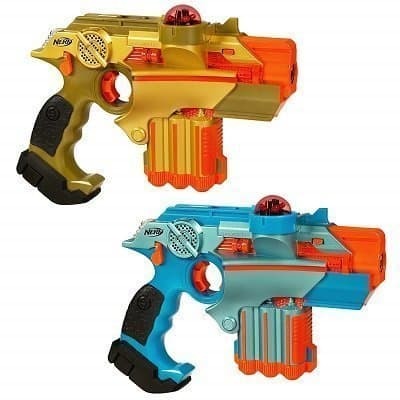 Although it is not a NERF brand, this is a great set made of high quality materials. Plus, at this price you don’t mind if your kids are a little aggressive and break one. Kidzlane uses high quality infrared lasers that run at .9mW, allowing for a great signal. 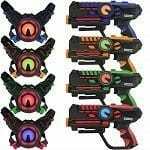 The Kidzlane laser tag blasters come in a 2 set or 4 set. Both cost around $15 per laser tag gun. The Kidzlane lasers allow you to pick your ammo type. With each game mode the guns fire like the ammo they are firing. The four game modes are pistol, shotgun, machine gun, and rocket. Depending on the type of ammo, the gun will allow you take more lives away from the opponent based on the power of the weapon, but the number of shots go down on the greater damage weapons. Shoot your opponents accurately at up to 130 feet away. The Kidzlane lasers allow you to play a game with up to 4 teams. 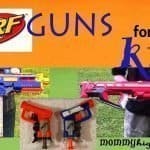 This is a great gun set for kids ages 5-years-old and up. USA Toyz is a good laser set that I think is particularly good for younger kids. If your child is under 7, this might be the best option for you. As the name says, the service folks for USA Toys are based in the USA so customer service and warranty is better than some of the other laser tag sets listed in our review. 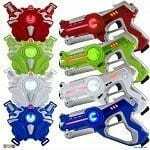 This set, like a few others, offers 4 game modes that allow you to change the weapon mode on the blasters. USA Toyz lasers can switch between standard pistol, shotgun, rocket, and burst. These durable laser guns are fun and can bought at a good price. The USA Toyz laser tag set comes with 4 laser tag blasters as well as a laser tag spider. The laser tag spider is good so that kids can get a chance to practice their aim without having a friend to shoot at. This is a great set for a younger kid because of that add on. 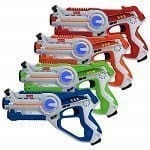 These laser tag blasters use a simple trigger firing mechanism that is easy for children to fire. This set can be used both inside and outside. From person experience, I’d recommend having your children play mostly outside or at least in the basement because of a game of laser tag can get a bit loud. The USA Toyz laser guns can fire and trigger another gun at about 130 feet out. I’d recommended this set for ages 4-years-old and up. The Play22 set is probably best value of the higher quality laser tag sets available online. This set comes with 4 laser tag guns as well as 4 laser tag vests. The Play22 laser blasters and vests come in bright blue, red, green, white, and blue colors. 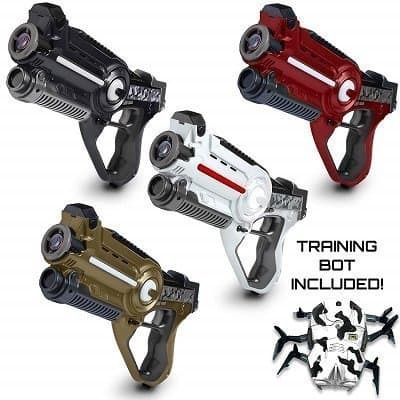 The laser tag guns light up during laser tag battles and add to the laser tag experience. At around $75, this set is a great overall value. I would consider this set a lower priced alternate to the ArmorGear set up above. It is less expensive, but isn’t quite as high quality. The Play22 set has a range of about 130 feet. Like many of the NERF-alternative laser guns, this set comes with four different types of weapon options. The weapons can be changed in game, and they affect how many remaining lives you take from your opponent when you get an accurate shot off. Each laser comes with 3 lives, and the number of lives lost depends on the weapon type used. Each laser tag set takes 7 AA batteries, or 28 for the set of 4. Batteries are not included in any of these sets. 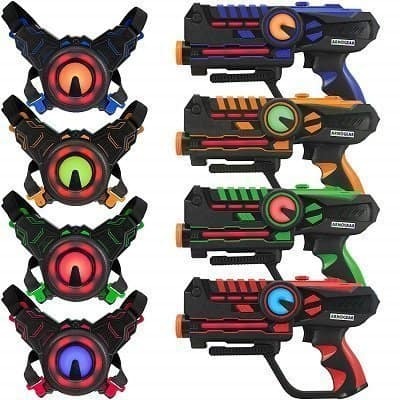 Multiple sets of these can be purchased and linked together to create large laser tag battles. All guns are made of high quality ABS plastic and are easy for kids of all ages to fire. I’d recommend this set for ages 5-years-old and up. According to Wikipedia, laser stands for Light Amplification by Stimulated Emission of Radiation and is a device that will emit light through amplifying light optically based on the stimulation of electromagnetic radiation. Albert Einstein explored the concept of lasers in 1917. Actual functioning lasers have been around for over 50 years. Lasers can be used in a variety of different ways including laser cutting, encoding data, bar code scanners, fiber optics, and in surgery. Are Laser Tag Guns Safe? Lasers can vary substantially in strength and function depending on how much the light is amplified from electromagnetic radiation. Laser tag guns use infrared light at a low amplitude and power so that it is harmless to kids and adults alike. Generally the FDA recommends lasers with a strength greater than 5mW should not be used anywhere near human eyes. These laser tag guns use less than .9mW, which is far less than the 5mW the FDA recommends. I’d still recommend telling kids not to intentionally fire laser tag guns into each other’s eyes. I’d recommend the NERF Laser Ops Pro Burst Fire Combat Blaster for serious adults, teens, and tweens looking for a laser tag set. These guns just look and feel great, and the stats that are available with the NERF Laser Ops Pro App make the game so much more enjoyable. I’d also recommend the ArmoGear Laser set for kids and those that want a set with a vest.